Following Caesar's genocide of the Celtic Veneti, Manapi mariners took over the lucrative sea trade (Irish Sea named Muir Mann after them). 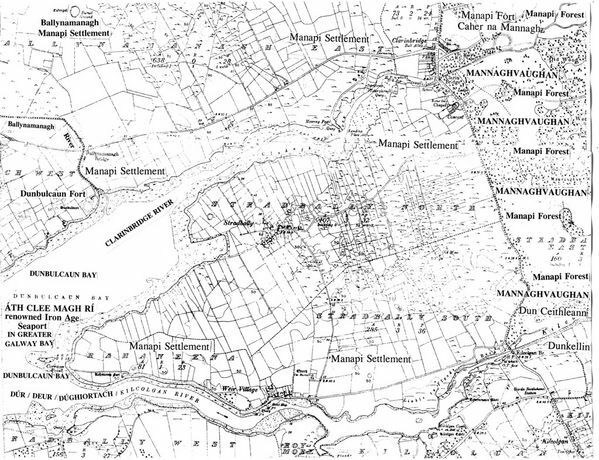 In Ath Clee Magh Ri (Map) traces of their potent presence survive in fort, forest, river, road & place names - Caher na Managh (Manapi fort), Dun Manannaun (shrine of their sea-faring god), Manavaughaun (Manapi forest), Sli Mhanann (Manapi road) & many Mannin & Managh Tlds. Toberorsaun Altar at Dunkellin (Cethelen - sea goddess)/Kilcolgan inner river mouth mirrors the Manapi ngChethelennia votive altar at the Rhine/Schelde (Ascaul) river mouth in Holland.